As told by Jerry Hamon from Mariner Sails. 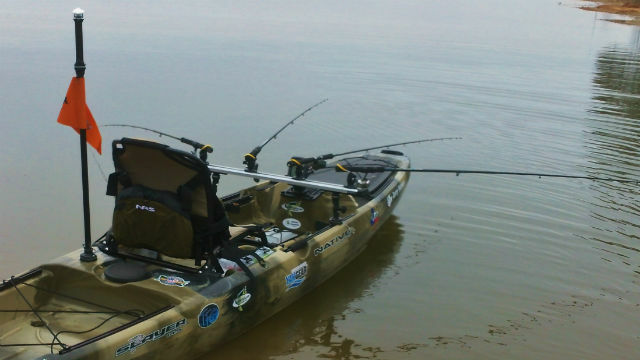 Earlier this year I started thinking about crappie fishing from my kayak. Those thoughts lead me to the idea of “spider rigging” from the kayak. My kayak (Native Slayer 14.5) has built in gear tracks on each side of the cockpit so I started asking around and looking for a bar or dashboard that would span the width of the kayak that I could securely mount multiple rod holders in or on. In mid-January I was at the Texas Tackle and Hunting Show and met the guys from Yak Gear and Railblaza. We all immediately started brainstorming. We measured the width of my gear tracks and determined that a 900mm dash would accommodate 4 Railblaza StarPorts and span the entire width of my kayak. A few weeks later the prototype of the Railblaza TracDash 900 showed up at my door. The dash had the 4 Railblaza StarPorts on top and an adjustable track on the bottom. I mounted a StarPort on both sides via the gear track at a distance about an arm’s length in front of my seat and installed the dash with Railblaza Adjustable Extenders (in order for my feet and legs to fit underneath it). Note – This was a prototype, the TracDash 900 available for sale now comes complete with everything you need for installation. I then installed 4 of the Bee Ready Rod Holders fitted with Star Port Adaptors into the 4 StarPorts on the dashboard. After a couple of weeks of extreme cold and rain I was able to take my kayak out and try the rig on the lake. I placed a 10 foot crappie pole in each of the rod holders and ventured out to try my hand a spider rigging for crappie. The rig work flawlessly and met or exceeded my expectations. I am adding a new Native Ultimate FX12 to my fleet in the next couple of weeks and am very excited about the possibility of being able to move the dashboard from one kayak to another. On the Ultimate, I intend to use the TracDash 900 for rod holders and my fish finder setup to where I can remove it when not in use. The dashboard has unlimited possibilities as far as rigging options are concerned. Thanks Yak Gear and Railblaza for another great product! For more on the new Railblaza TracDash 900, check out our New Product Release Blog HERE. We want to know what you think about Jerry’s first shot at the new Railblaza TracDash 900 from Railblaza! 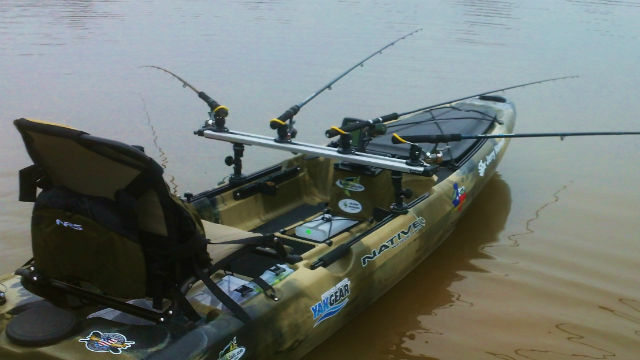 How would you rig the TracDash 900 for your style of kayak fishing? Tell us what you think! Comment below, reach out to us at socialmedia@yakgear.com or find us on Facebook, Twitter, and Instagram using the #YakGear hashtag!